Located five kilometers east of Mactan Island, Olango Island lies between the Bohol Strait to the south and the Camotes Sea to the north. To the east is the Olango Channel while to the west is the Hilutungan Channel. It has seven barangays, one of which is Sta. 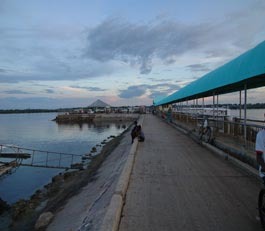 Rosa, where the islands wharf and parish church is located. 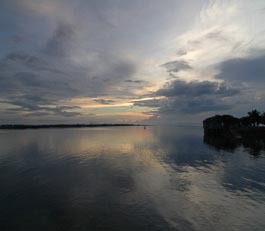 Olango Island supports the largest concentration of migratory birds found so far in the country. Migration starts from the breeding places of birds in Siberia, Northern China and Japan. Anticipating the scarcity of food and winter cold, these birds fly as far as Australia and New Zealand from late July until late November. This is usually referred to as the Southward Migration. By late February until May, these birds return to their breeding grounds in the reverse Northward Migration. Based on data gathered so far, the birds use Olango as a major refueling station as well as a wintering ground. At Olango, the birds can replenish their fat reserves by feeding on rich supply of invertebrates in the intertidal mudflats. These fat reserves must fuel the birds on the next lap of their journey which may cover from 3,000 to 15,000 km of non-stop flight. 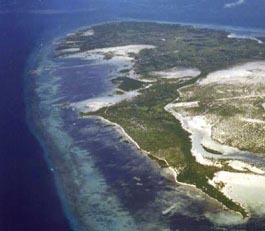 The western edge of this reef facing Hilutangan Channel opposite Mactan Island presents beautiful coral gardens and a dense fish population. The eastern side has better coral corners and more game fish.